COMMANDS (AUS) (Bay 1996-Stud 2000). 4 wins-3 at 2, STC Missile S., Gr.3. Leading Aust. Sire of Winners 3 times. Sire of 1166 rnrs, 829 wnrs, 69 SW, inc. Appearance (VRC Myer Classic, Gr.1), Epaulette, Purple, Undue, Paratroopers, Holler, Commanding Jewel, Skilled, Russeting, Erewhon, Rain Affair, First Command, El Cambio, Catalonia - Vilanova (Aust. ), Lamasery, Court Command, Paximadia, Soul, Rommel, Gregers, Ambidexter, Altar, Marching, etc. PINPOINT ACCURACY, by Pins. 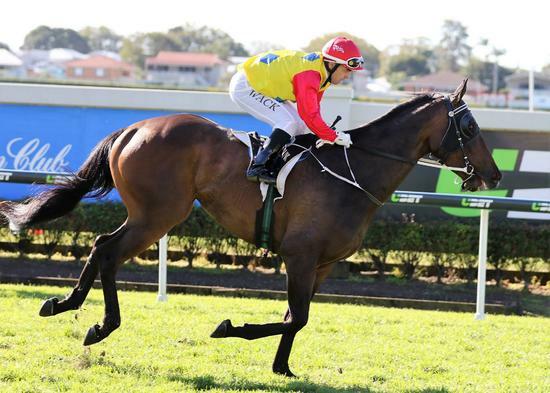 3 wins-2 at 2-from 1500m to 1650m, A$87,550, Qld Tatt's RC Tattersall's 2YO H., BRC Lyndhurst Stud H., Mitty's H., 3d BRC Race-Tech Australia H., Precision Badges H., Lyndhurst Stud H. Half-sister to COMBAT KITTY, MITRAAD. Dam of three foals, none raced. MITRAAD (Northern Meteor). 4 wins-1 at 2-to 1450m, R390,000, to 2015-16, Turffontein Secretariat S., L, Roodepoort Metal Exchange P., Edgeline S., 2d Turffontein Graceland Hotel Casino & Country Club H., 3d Turffontein Charity Mile, Gr.2. COMBAT KITTY (General Nediym). 2 wins-1 at 2-at 1000m, 1400m, A$445,380, VRC Lexus Hybrid P., L, 2d ATC Brian Crowley S., L, GCTC Magic Millions 2YO Classic, L, ATC Ashcroft H., 3d AJC Vale John Bradshaw 2YO H.
Pinpoint Accuracy. 3 wins. See above. Krupp Diamond. Winner at 1400m, 2d SAJC Reliance Athol Park H.
Feeling Positive. Winner at 1350m in 2015-16 in Aust. Panya. Winner at 2200m in 2015-16 in Aust. Mr Destructo. Winner at 1300m in 2014-15 in Aust. Double Luck. 5 wins at 1000m, 1200m, HK$4,257,550, Hong Kong Squash 50th Anniversary Cup, HKJC D'Aguilar Peak H., Sha Tin Heights H., Flamingo H., Morrison Hill H., 2d HKJC Hoi Ha H., Baker H., Racing Club P., Nam Fung H., American Club Challenge Cup H., Clear Water Bay H., Melbourne H., 3d HKJC HK Exchanges Challenge Cup, Happy Valley Vase H., Mission Hills Haikou H., Sunny Bay H.
Worth Every Cent. 3 wins at 1200m, 2100m, Avondale JC Waimauku Landscape Supplies H., 2d ARC NB Holland Medal H., Explore NZ H., Waikato RC Vero Insurance H., James Te Rapa TAB H., 3d ARC Radio Sport H., Rotorua RC Albion Hotel & Bar H., Brian Boru Hotel Thames H.
Torchymore - Siapa Rajah (Aust.). Winner at 1450m, 2d MVRC Members Equity Bank P.
DANAUPAIR STARLET (Delago Brom). 3 wins from 1400m to 2400m, A$140,036, SAJC South Australia Fillies Classic, Gr.3, 2d MRC Begonia Belle 2YO H., 3d Queensland Oaks, Gr.1, TRC Strutt S., L.
Springwater. 4 wins at 1200m, 1400m to 2015-16, CJC Ridewiththeaction H., 2d CJC Racecourse Hotel & Motor Lodge H., Speight's Mid Ale H., Hororata RC Yaldhurst Wools and NZWTA H.
GOVERNOR'S BAY (Zephyr Bay). 2 wins-1 at 2-at 1200m, 1600m, Waikato Guineas, Gr.3, Avondale JC Gurney H., 2d New Zealand Two Thousand Guineas, Gr.1, Great Northern Champagne S., Gr.3, 4th Waikato RC P & M Plaza Purse, L. Sire. ZEMINDAR (Zephyr Bay). 8 wins-2 at 2-from 1000m to 2100m, A$96,790, WATC Belmont Park Cup, L, Fairetha S., L, Avery H., Lloyd's Gold CPA H., Maikai H., Doric H., Emu Bitter H., Temple Coyn Welter H., 2d WATC Batavia H., NEC H., Swan Gold H., Easter Plate, Starglow Quality Sprint H., 3d WATC Bianco Lady Quality H., Ellis Quality Sprint H., Parker Welter H., Cypher H., 4th Pinjarra Guineas, L. Sire. HEAVENLY VIEW (Zephyr Bay). 4 wins-2 at 2-to 1400m, NZ$25,000, A$149,280, Manawatu RC Juvenile S., L, VATC Richard Ellis S., L, WRC Jim Beam H., SAJC Macrob H., 2d VRC Gadsden S., Gr.1, Bobbie Lewis H., Gr.3, HBJC Gold Trail S., Gr.3, SAJC Swettenham Stud S., Gr.3, VATC Herald Sprint H., L, 3d SAJC RN Irwin S., Gr.2, VATC GJ Coles S.H., Gr.3, MVRC Australia S.H. Zoning. 5 wins from 1300m to 2000m, AJC Adam Lindsay Gordon H., Amcal Red Cross Cup, Ganges S., STC George Greenwood H., Star of Heaven H., 2d AJC Gaulus H., STC Rodney Dangar H., Argyle Welter H. Sire.